God’s love and power were poured out upon His people in North Barito, Central Kalimantan. On July 21st – 25th, 2015 KPPI Jakarta team conducted a Mission Trip to the North Barito, where KPPI team held series of KPPI from village to village. 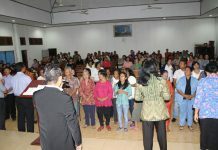 Praise and Divine Healing Service was held in 3 villages in North Barito: Payang village, Baliti village, and Kandui village. Praise and Divine Healing Service (KPPI) in Payang village was held on July 21th, 2015 in cooperation with GSJA Payang village that is pastored by Rev. Manik. It was served by Rev. Jong Johan from KPPI team who delivered God’s Word from Isaiah 53: 1-5 about God’s love and sacrifice for human beings, where the greatness of God’s love for humans so that He wanted to leave heaven and went down to the earth be the same as a man and was born in a sheepfold and died hanging on a cross. Praise the Lord, 93 present congregations believed in the Lord Jesus personally. Then continued to deliver the Word from John 5: 1-9 of a paralyzed person healed. It was stated that the congregations must have faith and believe in God and God never let us sick but God wants to heal, just as God cured a paralyzed man who had been sick for 38 years. When healing prayer, many congregations were coming forward to be prayed by God’s servants and counselors. That evening God healed a 3-month waist pain, heel pain, headache, tingling pain in the legs and arms for 3 years, nasal congestion, headache, and other diseases God cured. Thank God! All glory to God! On July 23rd, 2015 Praise and Divine Healing Service (KPPI) was conducted cooperated with GPdI Baliti village which is grazed by Rev. Aldi attended by 118 congregations. The service was started at 6.30 PM where a worship leader invited the congregations to praise God. It was a remarkable sight where each congregation that came, praised the Lord joyfully. While worshiping time, they were sincerely worshiping God. And it was continued with airing a film of healing testimony and the congregations seriously watched it. Furthermore, the Word of God delivered by Rev. Jong Johan (KPPI team) taken from John 3:16 where God loves mankind so much that He wanted to come down to earth so that those who believe in Jesus have eternal life. Followed then by delivering the Word of healing taken from Mark 5: 25-34 about a woman who had hemorrhaged for 12 years healed by the Lord Jesus as she had faith which believed in God. When healing prayer the Lord performed miracles, He cured those who had headache, nose pain, abdominal pain, pain in the left hand that was difficult to move, and uric acid. What an extraordinary God’s work which took place in Baliti village! On Saturday July 25th, 2015 Praise and Divine Healing Service (KPPI) collaborated with GSJA Kandui village who is pastored by Rev. Manik. Although in the afternoon in Kandui village, the rain poured down heavily, but the congregations still came. The service was opened by Rev. Manik, and followed by praise and worship. All the congregations praised and worshiped God earnestly. It was the time for them to listen to God’s Word, being delivered by Rev. Jong Johan (KPPI team) taken from Mark 4: 35-41 and John 3:16, in our lives do not be afraid and do not worry and keep believing in God because God never leaves us and God gives us His love for us to come to God. That evening there were 62 people who were present, believed in the Lord Jesus as their Lord and Savior. While healing prayer time, whole sick congregations came forward and the counselors prayed for them sincerely. Praise God that evening Lord Jesus healed one who had uric acid on the left for 1 year, 1-month waist pain, 2-week stomach ache, and 1-month headache. How great what God had carried out in Kandui village! Miraculous things which God had already done from village to village in North Barito, Central Kalimantan. God loved, saved, and healed His people in North Barito. All glory is only to God!